Utilize input from athletes when developing a training program, only they know how they really feel. Incorporate team bonding functions and avoid stale training programs. Cease resistance training in men prior to women in preparations for competition. Wash your hands and eat properly to avoid immune system dysfunction. Overtraining is a multifaceted diagnosis that has been found to effect 37% of elite swimmers between the ages of 16-20 (13). Swimmers most readily engage in a combination of strength and endurance training in order to elicit gains in performance. Concurrent training in bouts of high volumes and intensities leads many to become overtrained. This diagnosis is given to those who see decrements in performance due to the lack of appropriate time to recover from these conditions prior to competition (7, 10, 11, 18, 19, 23). Overtraining includes physiological and psychological factors that work synergistically to hinder the performance of elite swimmers (13, 22). This article will review physiological and psychological factors that contribute to overtraining in response to high volumes and intensities of resistance training performed by elite swimmers. Swimmers most readily take part in a concurrent training program, performing both resistance and endurance training. For most of the year, training takes place six days a week with a frequency of one to three times per day for a duration of one to three hours each. The volume of training depends on an individual’s race specialty. Sprinters, defined by those who’s best events include the 50 freestyle and the 100 of any stroke, usually perform two to six thousand yards per practice. Middle-distance swimmers are those who’s best events include the 100 and 200 of any stroke and both the 200 and 400 individual medleys. They usually perform five to seven thousand yards per practice. Distance swimmers are those who’s best events include the 500 and mile freestyle. They usually perform seven to nine thousand yards per practice. While these volumes are measured per practice, it does not account for the training that takes place outside of the pool. Swimmers also perform resistance training sessions and core work exercises. These may be done in a regular training cycle with individual loads or they may be done in circuit training, or most readily known as high intensity interval training which combines longer workouts with higher intensity resistance exercises. Lastly, swimmers undergo a period of taper prior to competition. This is a period of low volume and moderate intensity training that is intended to allow the swimmer to recover from the season while maintaining their training adaptations in preparation for peak performance. Though swimming is normally defined as an endurance sport, it also requires high levels of strength, especially core strength, to efficiently move through the water by means of kicking and pulling. Swimmers often engage in some sort of resistance training and dry-land activities that include using weights and medicine balls along with their normal swim workouts. There are certain protein pathways activated with each type of exercise and may interact with one another. Protein Kinase B (Akt) & mammalian target of rapamycin (mTOR) are phosphorylated during resistance training to stimulate muscle protein synthesis (14). Adenosine monophosphate- activated protein kinase (AMPk) is the energy sensor in the cell that senses low levels of ATP and high levels of ADP & AMP regularly seen with endurance training. When there are high levels of ADP & AMP, it stimulates phosphorylation of PGC-1a which activates mitochondrial biogenesis (2). This results in an increase in mitochondria and allow the muscle to better utilize fats via aerobic production which is favorable for energy synthesis (14). However, even though phosphorylation of Akt inhibits PGC-1a from stimulating mitochondrial biogenesis, this has shown to be negligible (2). In fact, evidence supports that resistance training in congruence with endurance training is beneficial for endurance athletes such as runners and cyclists (9). Evidence also shows performance benefits for concurrent training compared to resistance training or endurance training alone. In a study by de Souza et al. (2013), they found that participants participating in treadmill running and leg press exercises experienced gains in one repetition maximum and increases in hypertrophy similar to those who only participated in resistance training. Also, the same participants experienced gains in VO2 max similar to those who only participated in endurance training. This study provided evidence that participants that performed concurrent training saw benefits from both resistance and endurance training and that combining these types of training did not hinder the effects of each. This could be due to the bi-lateral shift in muscle fiber type towards type IIa (21). Type IIa fibers are the most favorable muscle fibers in regards to oxidative capacity, twitch speed, force production, and capillary density. Though these studies were not performed with swimmers. In a study by Aspenes et al. (2009), they investigated the effects on concurrent training in elite swimmers. They found that adding two sessions of maximal strength training per week to a high volume training regimen commonly seen in elite swimmers improved tethered swimming force and 400m performance, but did not result in gains in VO2 peak. However, it is important to note that there were gains in 50m and 100m performance with a small p-value but there was a small sample size and they were not statistically significant. They also found that there was no change in stroke rate or stroke length normally seen with improvements in sprinters after the intervention. Thus, they found that concurrent training improved middle-distance performance but that a larger sample size would be needed to conclude if concurrent training improved 50m and 100m performance. 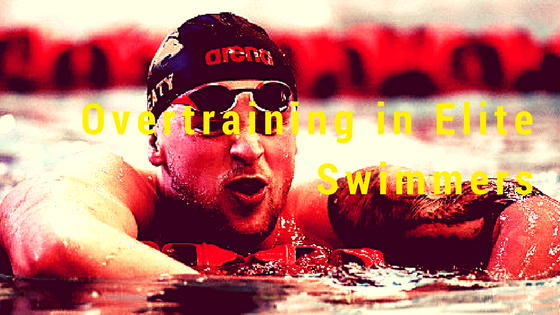 This article will take a look at the possible mechanisms involved in determining swimming performance and overtraining. There are many physiological factors that could be associated with overtraining. Though, these may be different for elite swimmers due to their style of training. A major hormone that has been shown to contribute to overtraining is cortisol (8). Cortisol is a catabolic hormone that is released when the body experiences stress. In average resistance training, there is usually an elevated acute response but a decreased chronic response for cortisol (17). There is also an increase in testosterone, favoring the testosterone:cortisol ratio for muscle protein synthesis. However, in a study by Fry & Kraemer (1997), they concluded that increasing volume or intensity in resistance training increases resting cortisol levels. An abnormal resting level of cortisol could be a marker for overtraining. However, some studies show no difference in resting cortisol levels between overtrained and well-trained swimmers, even though their levels of stress was found to be higher in those who were overtrained (10, 11). While other studies have found higher resting cortisol levels in overtrained swimmers compared to well-trained swimmers during baseline and training, but not recovery (19). These higher resting values at baseline could be due to anxiety in anticipation of training. Thus, even though increases in resistance training volume and intensity has shown to increase resting cortisol levels, there is mixed evidence to support whether or not it can be used as a symptom of overtraining in swimmers and unclear if increases in resistance training causes a swimmer to be overtrained. Another hormone to consider is testosterone. Testosterone is an anabolic hormone that stimulates muscle protein synthesis and muscle cell growth and is greater in response to resistance training. Testosterone levels are inherently greater in men, and acute responses are greater in men and either non-existent or only slightly elevated in women (23). However, decreased levels of total testosterone was seen in high volumes of resistance and endurance training in swimmers (7). This could suggest an inhibitory effect of the release of testosterone following resistance training due to endurance training. Furthermore, it could be result of the testosterone:cortisol ratio that leads a swimmer to be overtrained rather than the levels of each hormone alone. With this testosterone:cortisol ratio, muscle protein breakdown is favored and, when combined with heavy resistance training, could lead a swimmer to experience performance decrements and overtraining. While muscle protein synthesis is heavily dependent on hormones, it can be hindered by inflammation. Inflammation is a response from high intensity resistance training and prolonged durations of extreme training (16). Inflammation is a result of many factors including cellular damage that occurs during high force production in muscle cells. In a study by Margonis et el. (2007), they concluded that prolonged inflammation has been seen in overtraining due to a delayed response of inflammatory markers and sustained oxidative stress response, where there was a correlation between oxidative stress biomarkers and decline of muscle strength with heavy resistance training. As seen in figure 1, this means that a higher intensity and volume of resistance training in time interval three lead to a delayed response of healing and a significant amount of inflammation could still be seen during taper in time interval four. Another measure of inflammation is neutrophil count, which are white blood cells that flock to areas of inflammation. In a study by Hooper et al. (1995), they found that neutrophil levels were shown to be higher in overtrained swimmers during taper, but not different from well trained swimmers at any other point in the season. These studies suggest that high intensity resistance training could be a strong factor in overtraining in swimmers in regards to inflammation and a prolonged effect could lead to performance decrements if the resistance training program is not discontinued with enough time to recover prior to competition. Other markers that have commonly been used to diagnose overtraining are creatine kinase, nutrition, and infections. A common enzyme that aids in the production of energy is creaking kinase (CK). It is involved in the breakdown of phosphocreatine in short bouts of high intensity exercise seen in resistance training. Elevated levels of creatine kinase is a sign of muscular distress and inhibits muscle contraction due to their effect on decreasing the cell’s pH (20). Creatine kinase has been shown to be a good indicator of cellular damage in swimmers, as creatine kinase levels increased with high volumes of training and returned to baseline after recovery (7). Prolonged elevation in creatine kinase could indicate overtraining in swimmers as a result of resistance training. Overtraining has also shown to be an effect of malnutrition. As stated above, swim workouts can range anywhere from one to three hours. Most swimmers consume water or gatorade during this time in order to stay hydrated. However, for durations of exercise over an hour, protein must be consumed during exercise in order to elicit a favorable fractional synthetic rate. Fractional synthetic rate (FSR) is the rate of muscle protein synthesis over muscle protein breakdown. An FSR greater than one is favorable and means there is more protein synthesis than breakdown and the opposite if it is lower than one. Studies indicate that ingesting carbohydrates only and waiting to consume protein until after training results in fractional synthetic rates less than one, suggesting more protein breakdown (4, 12). Only subjects who consumed protein during workout experienced fractional synthetic rates greater than one, suggesting more protein synthesis (12). Thus, overtraining could be the result of greater muscle protein breakdown in swimmers. However, muscle protein synthesis is also correlated with the testosterone:cortisol ratio as mentioned previously in this article. Since overtraining due to high intensity resistance training favors muscle protein breakdown in regards to hormones, it is even more important to ingest protein during exercise to elicit favorable rates in muscle protein synthesis and avoid overtraining. Lastly, upper respiratory tract infection (URTI) is an illness caused by infection of the upper respiratory tract, such as the mouth, nose, throat, and lungs. High intensities and high volumes of training can inhibit immune function of protecting against these infections (15). Immunoglobulin A (IgA) is a common antibody that defends against these infections and research indicates a significant decrease in IgA concentrations in overtrained compared to well-trained swimmers suggesting an immune system deficiency in overtrained swimmers (15). High intensity resistance training puts high levels of stress on the body and could result in decreased immune function. Ultimately, overtraining is most readily defined as a lack of performance despite consistent training. Though we have seen that combining resistance and endurance training improves middle-distance swimming performance, adding resistance training in excess is the cause of overtraining. This is because exhaustion seen as a result of endurance training is obvious, while serum cortisol, testosterone levels, inflammation, and other markers mentioned in this article are not frequently measured or taken into account when developing training plans. Resistance training puts greater stress on individual muscle fibers and adding high intensity resistance training along with training performed in the pool can amplify the factors of overtraining, resulting in performance decrements in swimmers. For endurance athletes, a commonly used predictor of performance is maximal aerobic speed (MAS) and velocity at aerobic threshold (VAT). Greater maximal aerobic speed and velocity at aerobic threshold are favorable. Overtrained athletes normally see a decrease in speed at high percentages of MAS (3). Research indicates that overtrained swimmers who experienced increases in cortisol, decreases in testosterone, and elevated creatine kinase levels from resistance training saw decreases in speed at high percentages of their maximal aerobic speed, suggesting they were overtrained as a result of high intensity resistance training (23). However, these results were gender specific. Research also indicates that female swimmers display a greater ability to adapt to training volumes and intensities in regards to performance, suggesting women posses a greater ability to recover from training than men (1, 23). This could be the result of lower loads of resistance training performed by women due to different muscle fiber types and smaller muscle mass. Thus, resistance training could be a large factor of overtraining in swimmers and training plans should be gender specific in order to maximize performance. Many physiological factors have been found in swimmers experiencing overtraining, including decreased ability to fight infections, higher levels of stress and cortisol, lower levels of testosterone, prolonged inflammation of muscle tissue, and insufficient intake of protein during training to elicit proper recovery. Though, some of these factors cannot be easily observed and are not frequently measured, it is important for coaches and parents to pay attention to their swimmers in order to help them achieve high levels of performance. Frequency, intensity, and volume of both resistance and endurance training should be carefully managed, and input from the swimmer in developing training plans is required in order to maximize performance and avoid becoming overtrained. A special thanks goes to Tannah Broman and the Arizona State University library staff for all their help. Aspenes, S., Kjendlie, P., Hoff, J., & Helgerud, J. (2009). Combined strength and endurance training in competitive swimmers. Journal of Sports Science and Medicine, 8, 357-365. Baar, K. (2006). Training for endurance and strength: Lessons from cell signaling. Medicine & Science in Sports & Exercise, 38(11), 1939-1944. Bosquet, L., Leger, L., & Legros, P. (2001). Blood lactate response to overtraining in male endurance athletes. European Journal of Applied Physiology, 84, 107-114. Breen, L., Philp, A., Witward, O.C., Jackman, S.R., Selby, A., Smith, K., et al. (2011). The influence of carbohydrate-protein co-ingestion following endurance exercise on myofibrillar and mitochondrial protein synthesis. The Journal of Physiology, 589(16), 4011-4025. Cresswell, S.L. & Eklund, R.C. (2004). The athlete burnout syndrome: Possible early signs. Journal of Science in Sports Medicine, 7(4), 481-487.
de Souza, E. O., Tricoli, V., Roshel, H., Brum, P. C., Bacarau, A.V.N., Ferreira, J.C.B., et al. (2013). Molecular adaptations to concurrent training. International Journal of Sports Medicine, 34(3), 207-213. Flynn, M.G., Pizza, F.X., Boone Jr., J.B., Andres, F.F., Michaud, T.A., Rodriguez-Zayas, J.R. (1994). Indices of training stress during competitive running and swimming seasons. Internal Journal of Sports Medicine, 15, 21-26. Fry, A.C. & Kraemer, W.J. (1997). Resistance exercise overtraining and overreaching. Journal of Sports Medicine, 23(2), 106-129. Hickson, R.C., Dvorak, B.A., Gorostiaga, E.M., Kurowski, T.T., & Foster, C. (1988). Potential for strength and endurance training to amplify endurance performance. Journal of Applied Physiology, 65, 2285-2290. Hooper, S.L., Mackinnon, L.T., Gordon, R.D., & Bachman, A.W. (1993). Hormonal responses of elite swimmers to overtraining. Medicine and Science in Sports and Exercise, 25(6), 741-747. Hooper, S.L., Mackinnon, L.T., Howard, A., Gordon, R.D., & Bachmann, A.W. (1995). Markers for monitoring overtraining and recovery. Medicine and Science in Sports and Exercise, 27(1), 106-112. Hulston, C.J., Wolsk, E., Grondahl, T.S., Yfanti, C., Van Hall, G. (2011). Protein intake does not increase vastus lateralis muscle protein synthesis during cycling. Medicine & Science in Sports & Exercise, 43(9), 1635-1642. Kentta, G., Hassmen, P., & Raglin, J.S. (2001). Training practices and overtraining syndrome in swedish age-group athletes. International Journal of Sports Medicine, 22, 460-465. Little, J.P., Safdar, A., Bishop, D., Tarnopolsky, M.A., & Gibala, M.J. (2011). An acute bout of high-intensity interval training increases the nuclear abundance of PGC-1a and activates mitochondrial biogenesis in human skeletal muscle. American Journal of Physiology- Regulatory, Integrative and Comparative Physiology, 300(6), R1303-R1310. Mackinnon, L.T. & Hooper, S. (1994). Mucosal (secretory) immune system responses to exercise of varying intensity and during overtraining. International Journal of Sports Medicine, 15, S179-S183. Margonis, K., Fatouros, I.G., Jamurtas, A.Z., Nikolaidis, M.G., Douroudos, I., Chatzinikolaou, A., Mitrakou, A., et al. (2007). Oxidative stress biomarkers responses to physical overtraining; Implications for diagnosis. Free Radical Biology & Medicine, 43, 901-910. Meeusen, R., Nederhof, E., Buyse, L., Roelands, B., Schutter, G., & Piacentini, M.F. (2010). Diagnosing overtraining in athletes using the two-bout exercise protocol. British Journal of Sports Medicine, 44, 642-648. Morgan, W.P., Brown, D.R., Raglin, J.S., O’Connor, P.J., & Ellickson, K.A. (2013). Psychological monitoring of overtraining and staleness. British Journal of Sports Medicine, 21(3), 107-114. O’Connor, P.J., Morgan, W.P., Raglin, J.S., Barksdale, C.M., & Kalin, N.H. (1989). Mood state and salivary cortisol levels following overtraining in female swimmers. Psychoneuroendocrinology, 14(4), 303-310. Padalino, B., Rubino, G. & Petazzi, F. (2007). Training verus overtraining: Evaluation of two protocols. Journal of Equine Veterinary Science, 27(1), 28-31. Ross, A. & Leveritt, M. (2001). Long-term metabolic and skeletal muscle adaptations to short-sprint training. Journal of Sports Medicine, 31(15), 1063-1082. Slivka, D.R., Hailes, W.S., Cuddy, J.S., & Ruby, B.C. (2010). Effects of 21 days of intensified training on markers of overtraining. Journal of Strength and Conditioning Research, 24(10), 2604-2612. Y., Li, Y., Zhu, J., Zhang, X., Zhang, & Y., Zeng. (2012). Biochemical changes and endocrine responses in pre-competition training in elite swimmers. Biology of Sport, 29(1), 71-75. Photo of Michael Phelps retrieved from phttp://www.chasethewhiteline.info/swimming/injuries-that-face-swimmers/. Written by Grant Smith swam with Swim Atlanta in Roswell, GA for most of his life and then decided to continue his education and swim at Arizona State University. After a year of swimming, he decided to focus on school and his dream of attending graduate school to receive his Doctorate in Physical Therapy. He is currently coaching at Scottsdale Aquatic Club while he pursue’s a Bachelor’s in Kinesiology and is graduating in May. This is how and why even Strength & Conditioning coach would be better off if he has a deep understanding or being an ex-swimmer. Swimming coach themselves who implement out-of-water resistance training sometimes can be a bit clueless. Swimming involves alot of shoulder stress. Dryland training should avoid high shoulder stress activities. Swimmers without golden genetics can tend to mess up their shoulder much more easier than others. I can pull with size 4 (XL) stroke makers for 6k butterfly and not have my shoulders fall off, whereas the same can’t be said of my peers who have their shoulders ruined for the rest of their life. 1. If going to the gym and doing bodybuilding training with machines etc. as the main program for resistance training, then you are doing it wrong. Bodybuilding exercises are body parts training, they are specifically designed hypertrophy and repetitions are standard oxford sets. 2. If you approach a weighlifting coach, or for some unlucky reason ran into a crossfitter, and caught the fever of doing snatches and other technical overhead lifts then consider this; olympic lifts are highly technical, basically putting a weight up over the head is a risk. While movements like snatches, cleans are great in training explosiveness and generation of power (and very importantly, using movement chains as primary training focus instead of body parts,) but consider the risk versus rewards. Focus on improving weightlifting technique is another unnecessary thing to focus on. Meanwhile, it gives some less than elite swimmers a chance to venture into olympic weight lifting, hooray less 1 swimmer for the group. What swimmers need is a specific, customised GPP program. One that focuses on the imbalances of swimming muscles. This means that, lets say the swimming program calls for heavy mileage on the front crawl. Technically, backstroke, a reverse shoulder rotation should be incorporated into the program as a way to balance the forward motion, in order to avoid over development or rather the under development of rear delt. This is very common, as we see alot of swimmers with forward hunching shoulders. This is because their rear delt is weak. A programming overlook. THUSSSS, through dry land GPP training, we can address this issue by doing exercises that decompressess the front delt and strengthen the rear delts. This is just one example of what and how to choose and customise the GPP program. Ranting on too long, but in my opinion, not many swim coaches look into this detail, instead some just avoid doing dryland altogether.